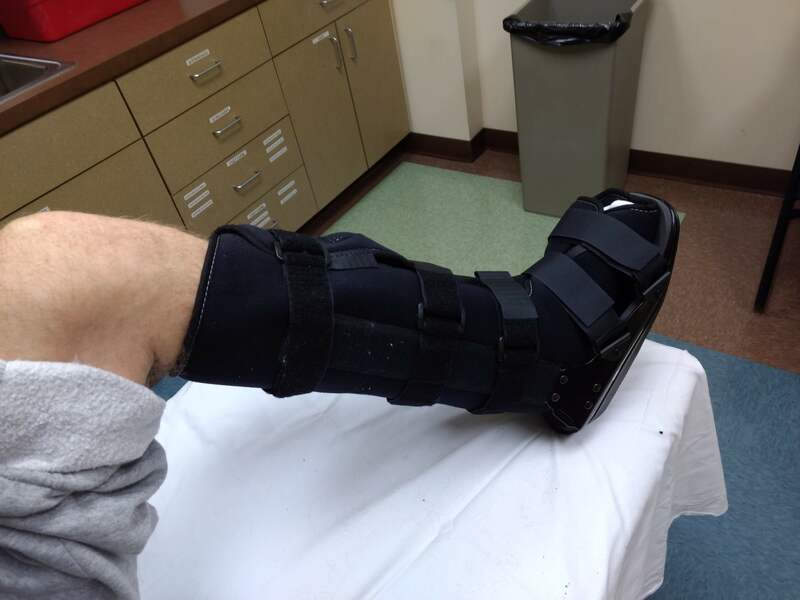 4.5 weeks Post Op, I get the BOOT! 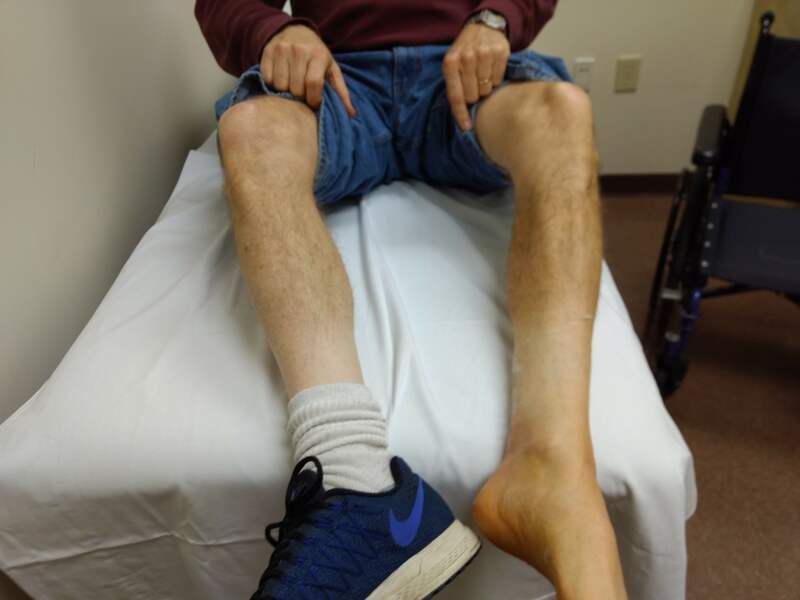 I was counting every night how many I had left, my cast never became real itchy, but the top of my foot became sore, and around the ankles, as the cast became looser (as my leg shrank, and swelling went down). 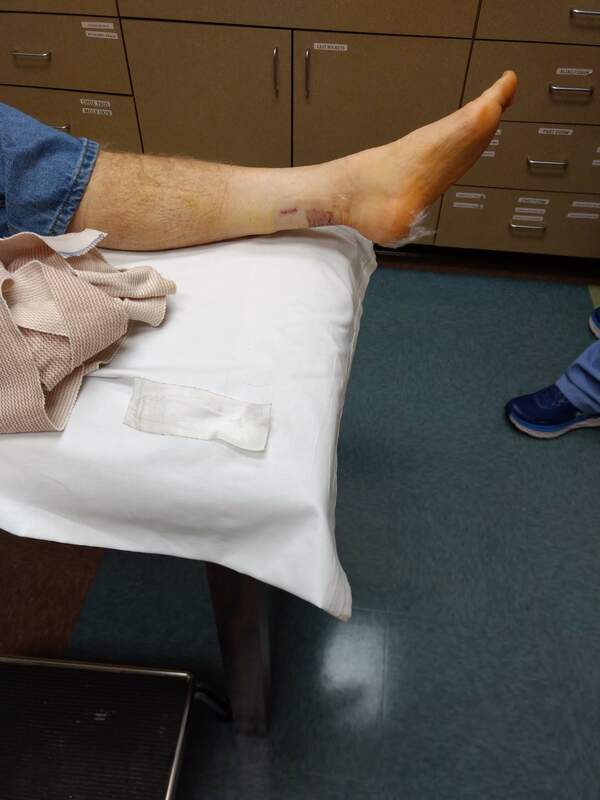 I think the loose cast was causing the pain and a little friction burn, but nothing to treat, and the leg looked pretty good, not too much smaller. First pic, I work with international students and they signed it in their mother tongue, notably I got Korean, Chinese and Farsi (Persian). 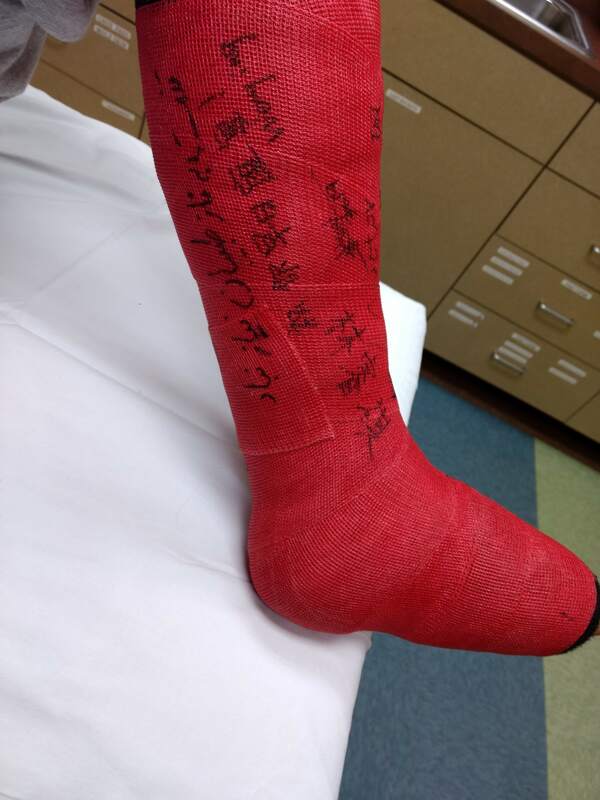 The cast maker said I could get rid of the gauze, and spray it with Lysol to prevent smells. They cut it off with a small saw, a little scary. And I hope to piece it back together. And now my new boot! 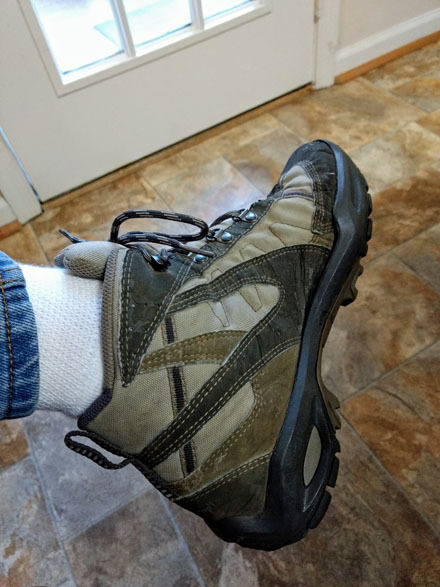 I had really wanted the Vacoped adjustable boot, but they were already set up with their own boot, with heel inserts, and you can enlarge it with air. CALL AND TALK WITH YOUR DOCTOR FIRST before getting your boot, if you want to discus using a boot of your own selection! Here is mine, I think it seems a little large, I did tell him my shoe size was 9. So I put a little weight on it today, by a little walking because I had a work activity. I leaned on one of my students, and I though I tried to put too little weight on it, it did hurt a little, but IBUprofen was sufficient. So I hope to rest more today, the day after. I have to keeo it on when walking and sleeping! However, when laying down or sitting, awake, I can take it off. I had previously scheduled physical therapy which the doc approved. I will get three times a week for three weeks, then my insurance changes, and I have to pay, so I will back down to once or twice a week. 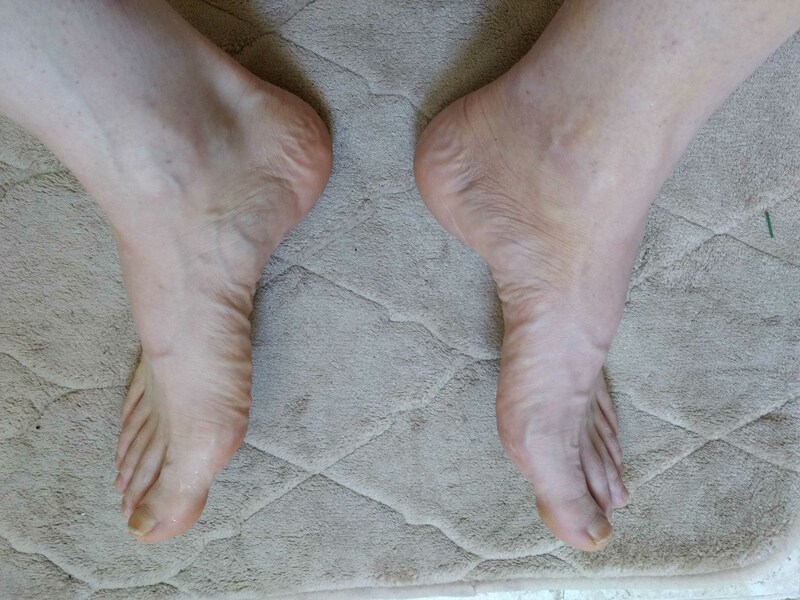 I’m looking forward to just rubbing and doing gentle stretches today and tomorrow before my first therapy. 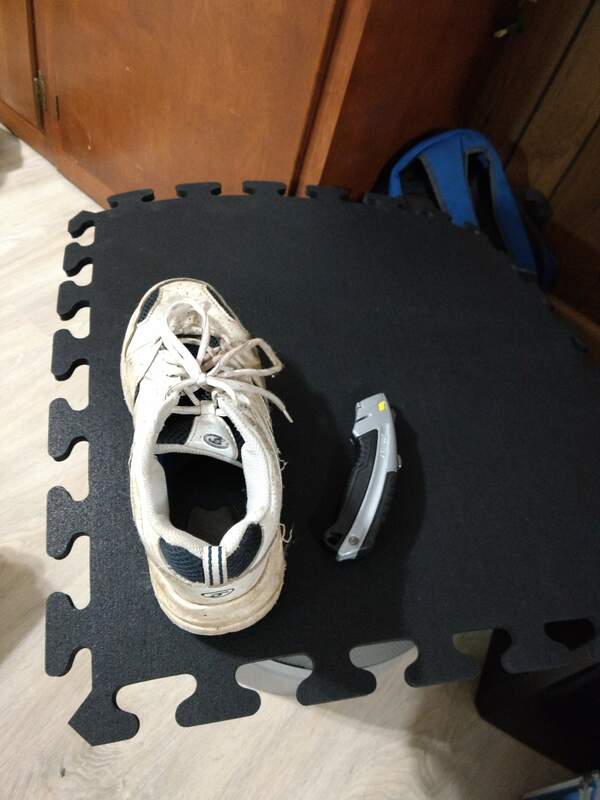 My home project was making a build up shoe! They recommended something to even up my hips when I walk, to reduce problems and pain. I could not find the kids puzzle play mats, but at Ollie’s I found this outdoor flooring puzzle piece. 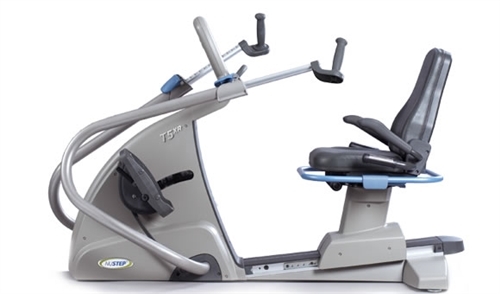 But it really is too heavy, and requires about 4 pieces to get a 1.5″ lift. It was super hard to cut, I dont recommend this material. I cut it with heavy duty scissors, a utility knife couldnt do it. I bought shoe glue at Amazon as it should be flexible, the Walmart shoe glue was the same price but only a tiny tube. You would need the bigger tube. 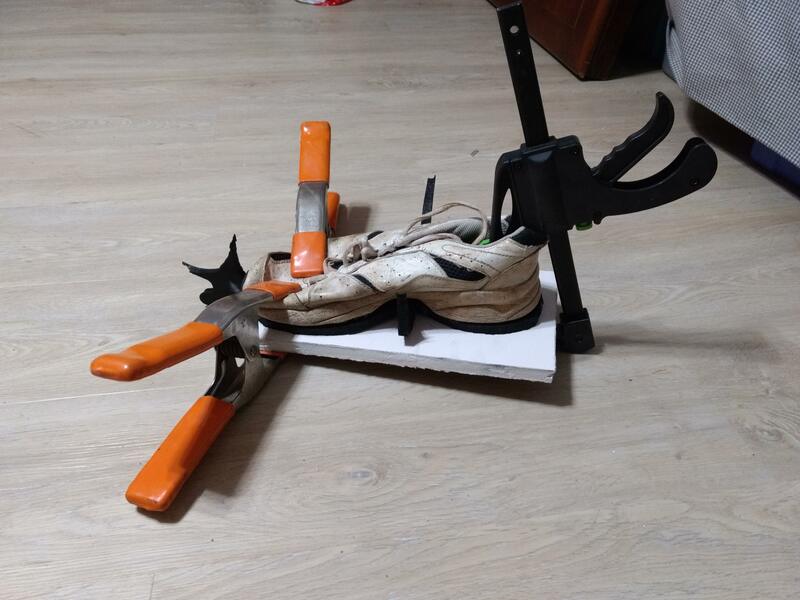 The clamps were needed as the bottom of the shoe is not flat! I will add another layer, take a picture, and try it out. My wife complained that the shoe was really old. Yeah, that’s why I chose my work shoe, so I can throw it away later! I forgot the picture for the shower bag. It has an elastic openning that slips over a cast or a boot. I also use a shower chair to sit on, and I prop up my foot on the side of the tub. I highly recommend it, even if it is like $20. No mess with torn bags and tape and tearing hair off your leg. You can find one at the achillesblog website, you want one that goes up to just below your knee. This shower bag was really great, I highly recommend it, even if it is $25. No mess with torn bags and tape and tearing hair off your leg. My foot after one week, about to get the splint/cast replaced with a newer one. 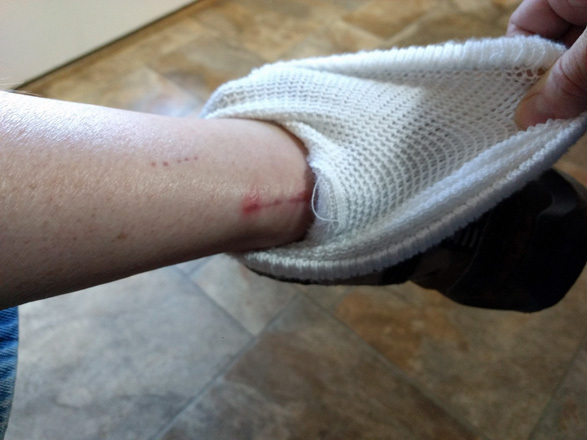 After two weeks, my splint/cast came off, I had lost already a lot of calf muscle in three weeks since the injury. The new cast is hard fiberglass, but the swelling is down so should be ok. I picked the color red, makes it very easy for people to see and feel sorry for me, I mean, not step on it. I had my splints/Ace bandage ‘cast’ removed and everything looked good. I really focused on elevation and ice and the doctor was pleased with how the swelling had gone down and the incisions were healing well. 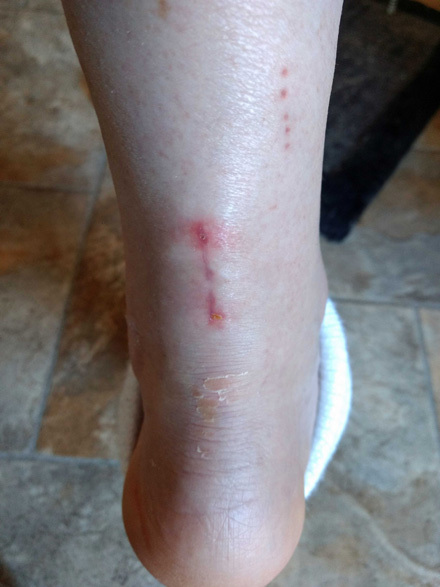 I also learned that it is common for other parts of the foot to hurt because of the swelling in the tight ‘cast’. And what had helped A LOT was to ice the part of the foot that HURTS, not just only the surgical site! Duh! 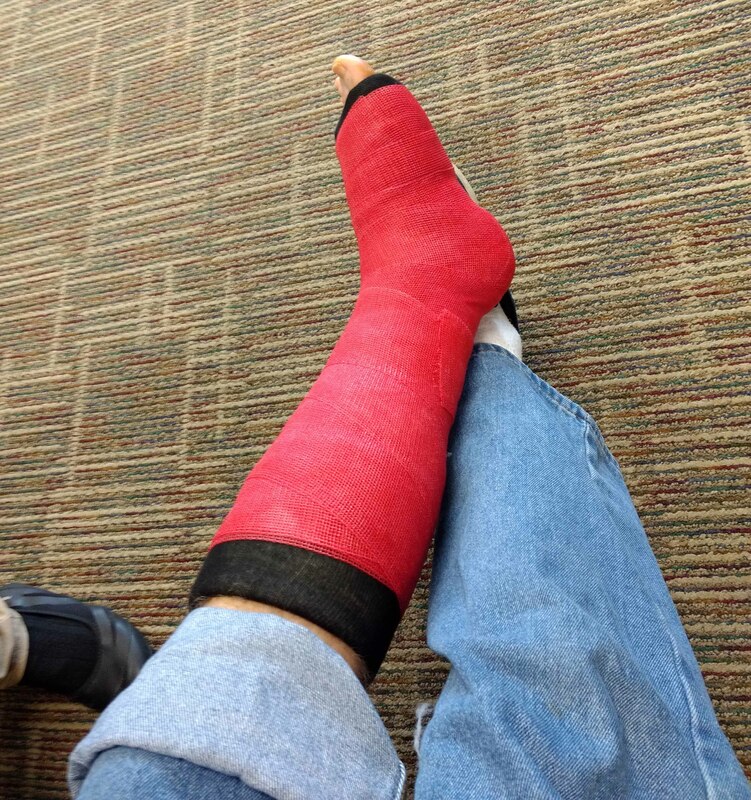 So the new cast is a REAL cast, solid, made with wet fiberglass cloth wrapped around a long sock over my foot nearly up to the knee, that solidifies when it dries, in about 5 minutes. They pushed, pointed my foot up to reduce the angle and make it closer to the normal. That really stretches the tendon, and I had a level of 2 and 3 out of 10 pain level. However, it calmed down within an hour and should be ok within a couple of days. I upped my pain pills, at their recommendation, for a day or two. But I was quite physiologically queasy of the idea of anyone touching and bending my new foot. It was small and naked and seemed so fragile. I lost a lot of my calf muscles already, and I have two more weeks with the new cast! I did enjoy caressing my leg/foot and gently trying to rub some life back into it. I hated to say goodbye to it. 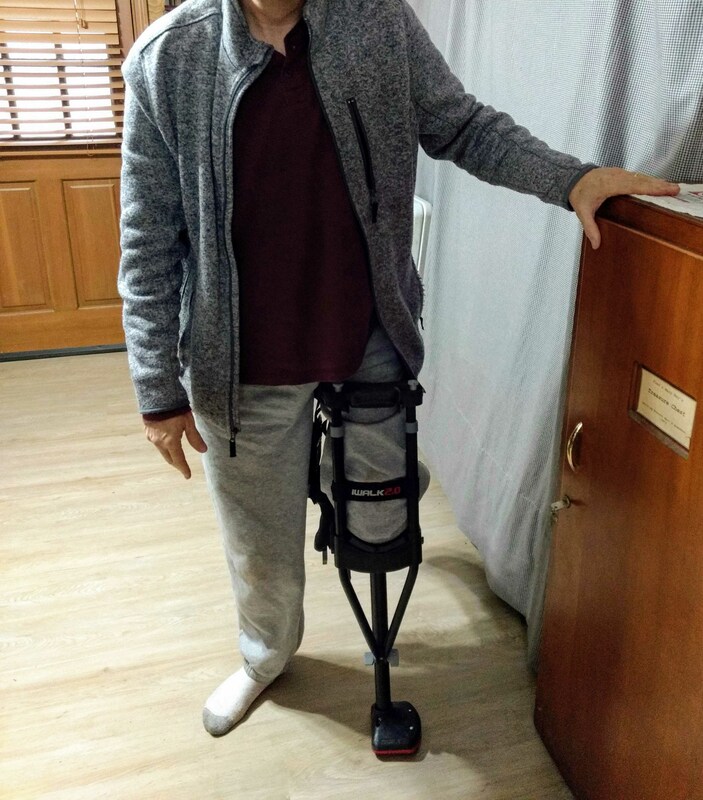 They thought the iWalk crutch would be fine, as long as I dont overdo it. But not to be working on the floors. They said the recovery is one of crossing several mountain ranges. At each peak there is pain, and you cross a new boundary, then it wears off and you have more ability, and are ok, until the next mountain/milestone. 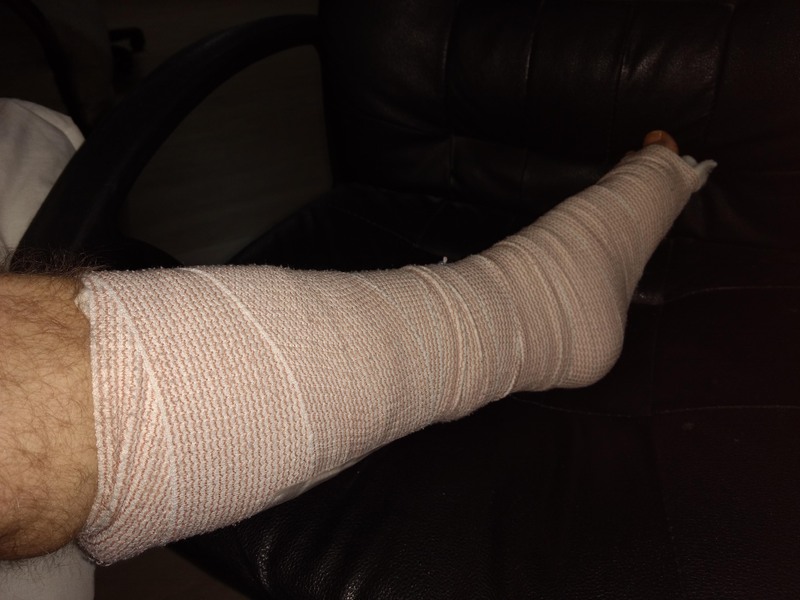 SUGGESTION: Bring pain pills with you to take immediately after the cast is put on. Im off the prescription pain killers for 1 1/2 days now. Just barely making it with IBProfen 800 mg every 8 hours, lots of ice and elevation still. 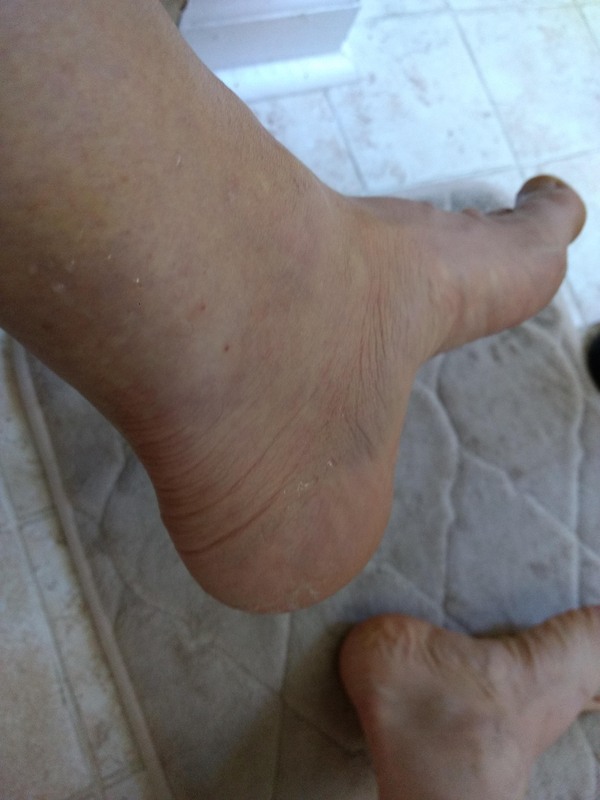 The foot feels heavy, swollen and painful when the IBProfen is about to wear off. Again, the pain seems the be in the rest of my foot, in a sprain(s?) while the incision feels good. Now Im really starting to sleep, like 3 hours at a time, three in a row. Seems the prescription pain killer, something like Hydrocodone Acetemphemine was keeping me awake. 5.31 out of 26.2 miles to full recovery.